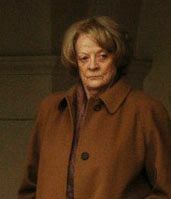 Dame Margaret Natalie Smith, CH, DBE (born 28 December 1934), known as Maggie Smith, is an English actress. She has had an extensive, varied career in stage, film and television spanning over sixty-five years. Smith has appeared in over 50 films and is one of Britain's most recognisable actresses. A prominent figure in British culture for six decades, she was made a Dame by Queen Elizabeth II in 1990 for services to the performing arts, and received the Companion of Honour from the Queen in 2014 for services to drama. Read more on Wikipedia.